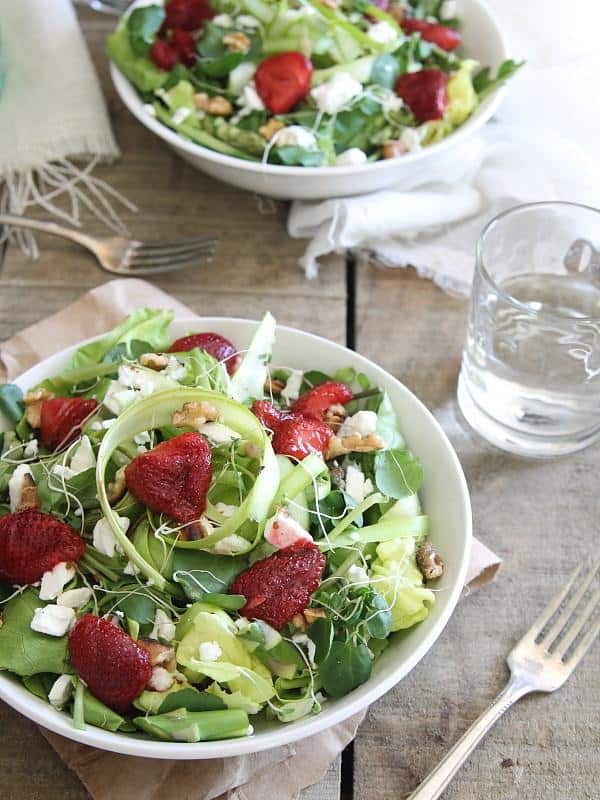 This honey roasted strawberry feta salad balances the intense sweetness from the roasted strawberries with the fresh, peppery watercress and asparagus greens and the salty feta. I know this makes me weird but one thing I always feel is missing from party spreads is a nice big salad. There’s always plenty of chips, dips, finger foods, cheese and fruit platters, but hardly ever anything green! It kinda drives me nuts because if there’s a nice big pile of green next to the chips, cheese and whatever other carb fest foods are at my disposal, it obviously completely negates those things (and means I can try one of every dessert). And then of course when there is, it’s some mixed iceberg salad with your typical cherry tomatoes, carrots and bottled dressing options. Lame. Brought to you by President Cheese. So when Président® asked me to share one of their recipes that would be perfect for parties, I picked a salad that would garner a bit more excitement. Strawberries and feta are a classic combination, the sweet and salty thing just works. To make things even sweeter and deepen the flavor a bit, these strawberries took a little bath with some honey and then got all hot and bothered in the oven for about 30 minutes. The result is a deliciously sweet, roasted soft berry whose juice is drizzled on top as the dressing. No oil or vinegar even needed. Combined with the salty feta crumbles, peppery watercress, fresh shaved asparagus and toasted walnuts, I’m betting no one is going to miss the iceberg. Place strawberries and honey in a bowl and toss to combine. Transfer strawberries to a baking dish and roast for about 30 minutes until the strawberries have softened and released their juices. In the meantime, assemble the greens in a salad bowl. Top with feta and walnuts. 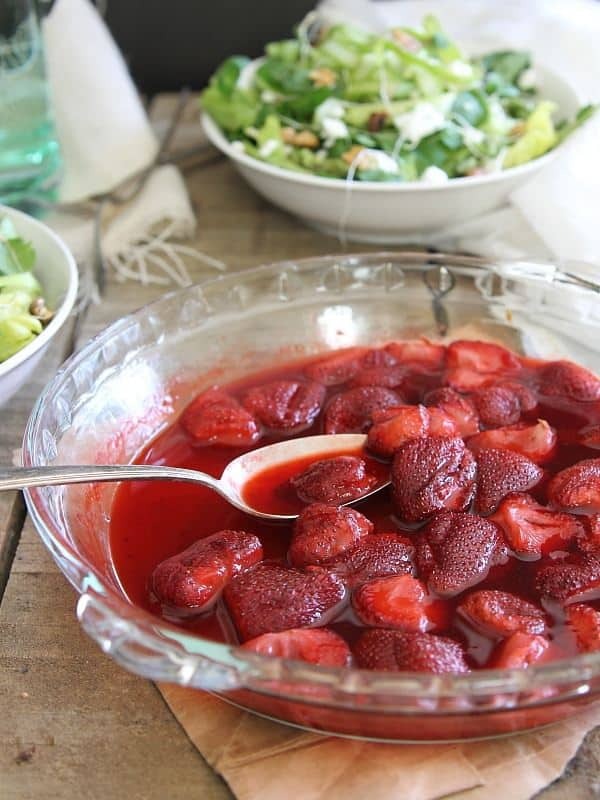 Spoon the strawberries on top of the salad once they're finished roasted. 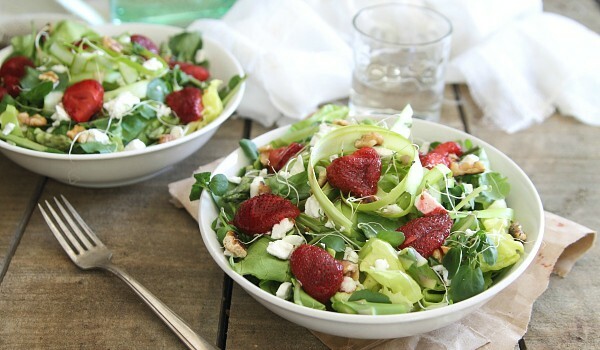 Garnish with alfafa sprouts and spoon the strawberry juice from the baking dish over top as the dressing. 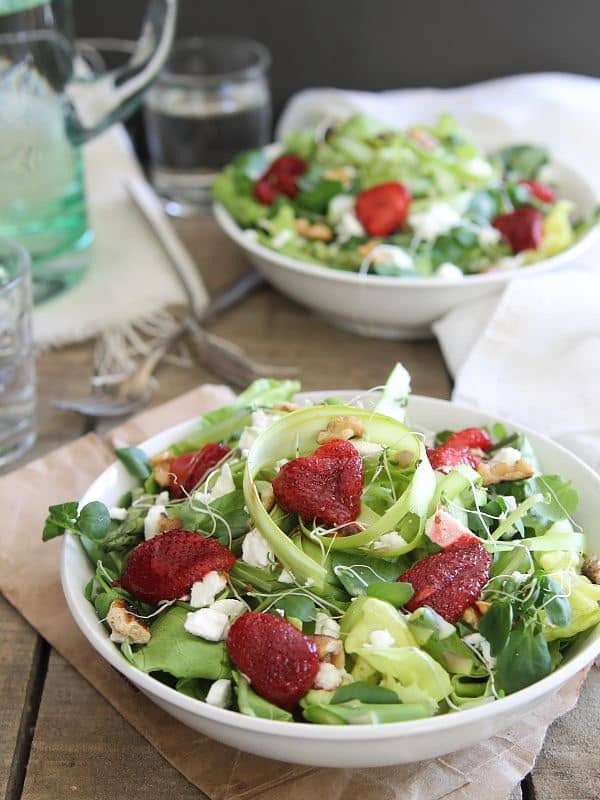 Healthy and delicious salad.. looks so elegant! This is so pretty Gina! I love this recipe. It will be a fabulous recipe for when we have friends over. Thanks for sharing with us! I love it. I’ve never roasted strawberries before, but it seems like I have a reason to now! Back home (in Puerto Rico) we often pair cheese and fruit preserves or pastes, so I can very well picture this particular combo! Thanks for sharing. This looks absolutely wonderful!! What a beautiful summer salad, and exactly the kind of salad I love to make :) I totally agree with the need for a big beautiful salad! Thank you! I bet this is an amazing combination of sweet and salty. Great pics! You need a Pinterest button on your pages. If you have one, it isn’t apparent. My apologies…just found the Pinterest button, I must be blind! Looks absolutely delicious. I love salads with fruit added.